Bonnie Gale's drawer baskets are personally hand-woven to your specifications. Although typically made for the kitchen, they are appropriate for any room of the house. Willow drawer baskets are the perfect accent to turn that mundane kitchen into something unique and special! The baskets are custom designed to fit the frames supplied by the client's cabinetmaker and made to fit the custom woodwork of the kitchen involved. Bonnie does not supply the frames. The baskets are first woven up to the border. Based on the custom work, the frames are then marked and holes are drilled in the frames to accommodate the stakes of the baskets. The stakes are then taken through these holes and then a border is woven with the stakes on the top side of the frame. In this way, the baskets are literally incorporated into the frames and gives an excellent product for the client. Corner posts are used in the rectangular baskets in order to emphasize the squareness. The holes are drilled by a local woodworker after Bonnie has custom marked each frame and the hole drilling is an additional charge. 6. If the frame dimension is over 20 inches in any direction, please consider an additional basket. To give an estimate of cost, Bonnie needs to have the interior and exterior dimensions of the frames. A faxed drawing is an ideal way to proceed. Her fax number is 607.336.9031. Bonnie also needs the height of the basket BELOW the frame (see Diagram B - Side). 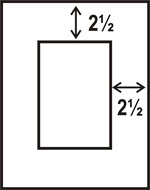 This figure will be determined by the client's cabinetmaker. Some guidelines are that a MINIMUM of 1 1/2 inches should be allowed between stacked baskets (see Diagram C - Cabinet). This dimension is from the bottom of the top basket to the top of the border of the lower basket. The border weaving is approximately a half inch of weaving above the frame (see Diagram B - Side). "STEAMED BROWN" -- the brown rods are given an additional steaming to produce a deep brown color. "BROWN" -- the rods are dried with the bark remaining which has a greenish-brown hue. "BUFF" -- the rods are dried with the bark on and then boiled in tanks for several hours. The subsequent peeling result in a soft red-brown color. Buff willow is the most popular. "WHITE" -- the rods are peeled to reveal a white rod. Once the frames have been designed and the height of the baskets below the frames has been determined, Bonnie will work out a cost. The cost per basket is based on the size and can vary from under a hundred dollars to several hundred dollars. Bonnie requires a 50% deposit up front. When Bonnie receives the deposit and the frames, she will complete the work within an agreed time. When the baskets are shipped, Bonnie bills for the remaining charges plus the hole drilling (about $25 per frame) and the shipping. All clients are expected to remit the balance within 30 days. Above photo by Meg Domino. 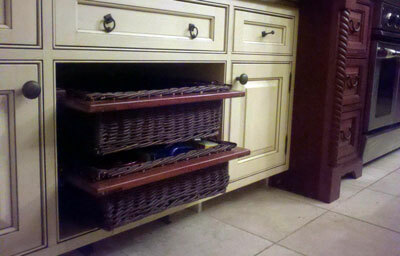 Here are some examples of the kitchen drawer baskets that can be created for you. Each thumbnail may be clicked for a larger photo.